Tuning into distractions can ruin the opportunity to nail your gymnastics routine. 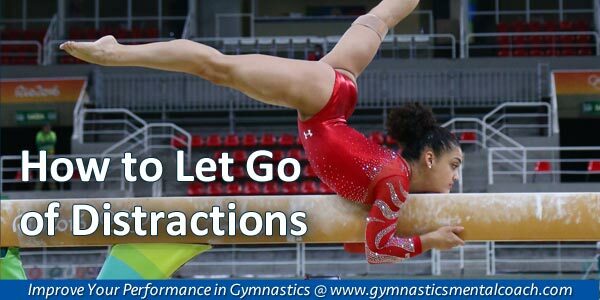 Many gymnasts talk about how they consistently hit their routines in practice then, all of a sudden, miss landings, bobble on the beam, slip off the bars or under-perform when it matters most. These gymnasts often blame performance anxiety for their inability to perform. While it is true that anxiety takes you out of your game, the direct cause of anxiety is thinking ahead about the what ifs. Ava performs her round-off, back handspring, back tuck practically flawless. Everything changes for Ava in competitions. Ava’s floor routine becomes riddled with mistakes. Ava’s mind runs wild with doubts and fears, so much so, that she has difficulty remembering her routine. 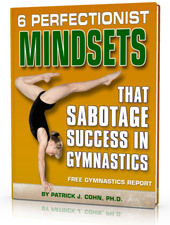 You can’t enjoy gymnastics when negativity and anxiety control you and affect your routines. Gymnasts who under-perform in competition are usually at a loss to find a solution to this dilemma. Oklahoma University Women’s gymnastics has been firing on all cylinders this season. The No. 1 Sooners recently achieved their third best-score in school history grabbing a first-place finish at the 2017 GymQuarters Mardi Gras Invitational. The Sooners beat three top-15 squads, No. 2 LSU, No. 10 Georgia and No. 15 Missouri and snatched the title. The Sooners held nothing back and were aggressive from the very first rotation which set the tone for the rest of the competition. OU head coach K.J. Kindler talked about how the team’s record performance hinged on the team’s ability to focus and totally immerse themselves in each routine. When you immerse yourself in the moment, one skill at a time, distractions are minimal. Being in the present moment places you in a distraction-free zone, allowing you to perform your best. Or you can chose to focus on the crowd, scores, fear, past mistakes, negative thoughts or what others might think about how you perform a routine. These distractions and worry undermines your confidence and trust. Most athletes don’t separate distractions from what’s important to their routines. First, always focus on what you want to happen, rather than what you fear might happen. Second, understand what performance cues will help you perform each routine–define these with the help of your coach. Next, be aware of your top distractions–so you can refocus when your mind starts to wander. 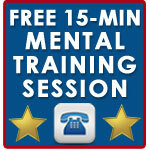 The key is to lock your mind into your mental choreography or performance cues. Don’t try to block out distractions. You only bring them more into your mind. If you get out of your mental routine, stop, regroup, and refocus on the next skill. 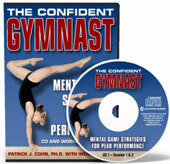 Learn all my strategies for focusing your best in competition with The Confident Gymnast CD and Workbook program.